In 1965 at the age of 92, Mrs. McCallum, donated her collection of paintings to the Penticton Art Club to do with as they saw fit. 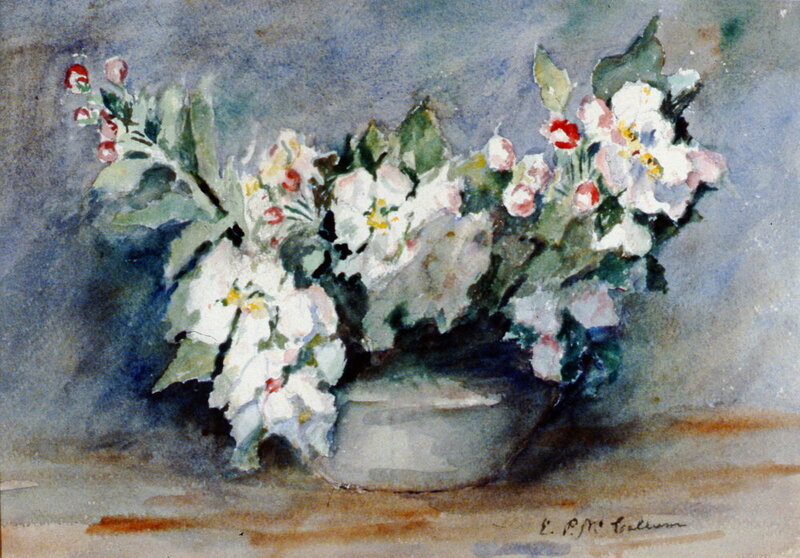 The club selected two of her works to retain and sold at auction the remainder of the collection. The proceeds were to begin the Show Committee fund for the purchasing of a permanent collection, a children's picture loan fund and to establish a scholarship for the Summer School of the Arts. Ethel McCallum was an American born, naturalized Canadian. As a young adult, she studied at the Maryland Institute of Art and Design. She was a resident of Keremeos for forty years, where she and her husband ran an orchard. After his death, she moved to Penticton and began painting again, at age 80. A one-man show of 100 of her watercolours was held in 1961 in the Masonic Hall. She died in 1967 at the age of 94.